Thanks to Graydon and Leslie Hilyard and their wonderful book, Carrie Stevens: Maker of Rangeley Favorite Trout and Salmon Flies; Stackpole Books, 2000, much of the historic information about the career and personal life of fly tier, entrepreneur, and milliner Carrie G. Stevens is preserved in the marvelous documentation of photos and written accounts in the book. The portion of the fly tying community who are interested in nostalgia and historical preservation owes Graydon and Leslie Hilyard a debt of gratitude for capturing this information before it slipped into the forgotten vault of the past. Pamela Bates, daughter of Joseph D. Bates who was a friend of Mrs. Stevens and for whom the Colonel Bates streamer was created, wrote in the foreword to the book: “One of the many glories of Hilyard’s research is that he grasped what is most probably the last opportunity to document what little primary source material remains.” Pamela also wrote of Carrie, “As she aspired to perfection, she became the first American tier to employ the British tradition of creating flies for the fishermen and letting the fish take care of the rest.” Indeed. As we visited at my table, Ed showed me this pair of Pink Lady streamers; the unique aspect of these two flies is that they were dressed by sisters, Carrie Stevens and Elizabeth Duley. 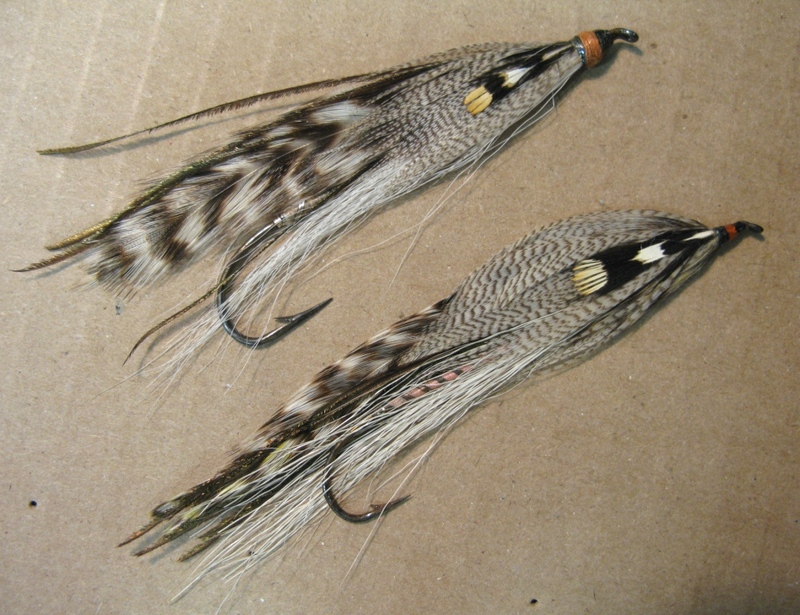 The streamer at the top was tied by Elizabeth, and the bottom fly was dressed by Carrie Stevens. Pink Lady streamers – the top fly was tied by Elizabeth Duley, sister of Carrie Stevens, the bottom fly was dressed by Carrie G. Stevens. Photo by Don Bastian. I took the photos hand-held with my Canon G9 Powershot using no flash. (I really never get good results photographing flies with flash). Carrie most likely created her Pink Lady streamer as a conversion from the famous wet fly created by George M. L. LaBranche, author of two books: The Dry Fly and Fast Water, 1914, and The Salmon and the Dry Fly, 1924. It appears the hooks are the same size, but look to perhaps be from different manufacturers. The heads are quite different; Elizabeth’s head is much larger that Carrie’s usual elongated, narrower style and shape. It is important to note that both heads have Carrie’s color band, here appearing to be orange. According to the recipe published in Hilyard’s book, the Pink Lady has a head band of pink thread. Note the length of the bodies on both flies, the body ends above the hook point, while some of Carrie’s flies have shorter bodies. Elizabeth’s Pink Lady lacks the tag of flat silver tinsel; it would appear that Carrie’s fly includes it, but it is difficult to see under the bucktail belly. Note the ribbing – Carrie’s is counterclockwise, while sister Elizabeth wound the rib to the right. Finally, there is an obvious difference between these flies in the shape of the feathers used for the wings. Most Rangeley style streamer devotees have a strong preference for hackles that are not too wide and also not too long, not too narrow, and not too pointed, preferring more rounded hackles as on Elizabeth’s rendition of the Pink Lady. Carrie’s pattern here clearly utilized some hackles that are narrower and more pointed than what is usually recommended and preferred by experienced Rangeley style streamer fly tiers. This indicates her resourcefulness to use materials at hand, even if they are not of the preferred shape. Fly tiers have been making adaptations and adjustments in their tying for centuries. I wanted to share these flies through my photos because I believe this is a very interesting bit of history, illustrating the differing fly tying styles between sisters Carrie Stevens and Elizabeth Duley. Pink Lady Streamer tied by Carrie Stevens. From the collection of Ed “Muzzy” Muzerol, Don Bastian photo. This entry was posted in Carrie Stevens Pattern Dictionary, Streamers and Bucktails and tagged Carrie Stevens, Elizabeth Duley, Pink Lady. Wonderful Post Don. I’ve never had the opportunity to see them presented in this way. It’s obvious from looking here that Carrie was indeed something special. She had an eye for materials and proportion that is hard to match. After seeing this, I know that there have been some flies I’ve seen being touted as “possibly tied by Carrie Stevens” that are most likely Elizabeth’s work. Not that anyone was trying to defraud, as the materials and age of the fly was correct. Thank you Darren. It is always enjoyable to hear your input and comments, thanks for your compliment. I was looking at these flies for a couple minutes when it suddenly dawned on me, I have my camera…photos! Very unique to have the same pattern side-by-side tied by Carrie and Elizabeth. Thanks again! Thank you Chris! Nice meeting you at Somerset last weekend! […] Carrie Stevens and Elizabeth Duly – Sister’s Pink Lady Streamers « Don Bastian Wet Flies. Thanks for the pingback John (though I have no idea what a pingback actually is…I’m gonna guess and say it’s an automatically generated computer thingey…appreciate your following my blog! Very interesting article here Don. Thank you for presenting these wonderful photos, and your thoughts. I agree about the “signature”. I personally don’t think Carrie would have been offended if anyone used the color bands on their heads, any head to be more specific. I think she would of been flattered, not angry. She was the master in my opinion. People will love her flies for eons of time. Thank you very much Kelly! Also thanks for your detailed reply and personal observations on this, always reaffirming to have others agree on a topic. Very interesting differences, for sure. Just little things, but that makes all the difference. Thank you Erin, appreciate your comment and observation. Don, very interesting observations & pictures of a piece of history! This adds to the mystique and allure of Carrie’s legacy. I have always left the band off out of respect for her, but this puts it in a different light! Thanks for the posting! Thanks for your comment here; I appreciate your input and observations as well. It is all so fascinating…Thanks again! 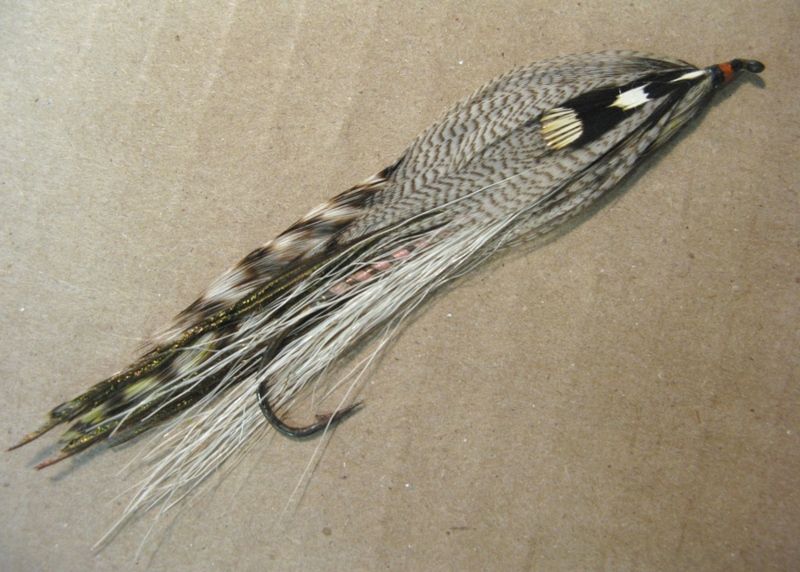 This is the reason when I started tying that I would never have a black head on a Carrie Stevens streamer. It just doesn’t feel right, it doesn’t. I know I am still a greeny but I really feel strong about this. Hasn’t anyone thought that these two are sister, they have a very close relationship? Now do you think Carrie would let Elizabeth put the banded head on her (Elizabeth) streamers if indeed it was Carrie’s signature? No way am I letting someone else use my signature (if I had one); it’s mine. They tied during the same time. I would like to think that if the signature was such a big deal that Elizabeth would have been told and would honor the request. That was a new thought that sprouted, no pun. Happy New Years!! Believing that Carrie more likely than not, wanted her sister to include the band, not so much to “copy” her “signature” but to include the component as a part of the pattern, and also to designate it as one of Carrie’s fly patterns; not an original, but how she tied it. And she wanted Wendell Folkins to continue that for the 43 years he owner her business. Thanks for your comment!